CANYON Keyboard CNE-CKEY2 (English layout) This multimedia keyboard is designed to make access to o..
Etrain KB011 Keyboard And Mouse Wired Black1. Streamlined lowkey cap 2. 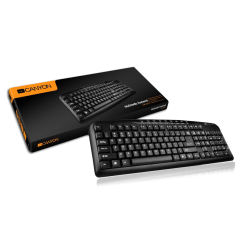 High-quality carbonfil..
Canyon Desktop Wired keyboard & Mouse Set - CNE-CSET1-US Connectivity Technology - WiredInterfa..
Logitech K120 Keyboard USB US International - 920-002479Product Description: Logitech K120 - keyboar..